Early in the morning each Fourth of July, the mother hens go out to the watermelon field to check for ripe melons. They thump them with their feet until they find one with a dull, hollow sound. Then the goats, who like watermelon too, tie a rope around it and drag it back to the barn. Later that day after the barbeque, everyone goes for a refreshing swim or a row on the pond while the geese cut up the watermelon and set it out. One of the horses gets the job of letting everyone know it's ready. "Hrrumph!" he says as he clears his throat. Then he whinnies in the loudest voice he can, "Wah-ah-ah-ah-ah-ter-MEL-on!" The sound carries far and wide. Ferdinand and Nina had just come out of the water when they heard the watermelon call. They raced to the picnic table and there it was! A big, juicy slice of watermelon just waiting for hungry chicks to eat. What a delicious treat on a hot July day! Is watermelon a summer treat for you too? 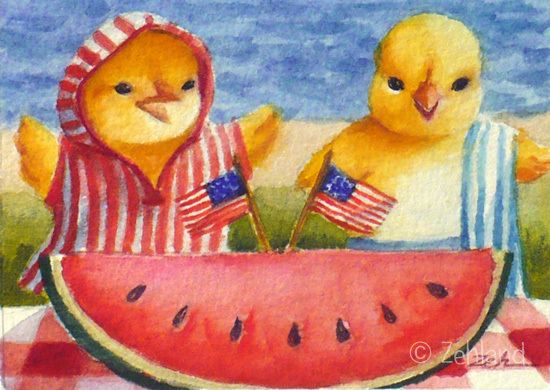 Watermelon on the Fourth of July print is available for sale in Zehland Etsy shop!